Work on at least several pieces at a time. This depends on size: the smaller the pieces, the more I have in the works at once. Do only a few things to each piece before moving on to the next. I try to stop before I get stuck, and let the pieces remain in process for as long as it take. This approach helps keep up the momentum, but of course nothing can totally eliminate the occasional frustrations of making art. Lorraine Bell's new book, The Art of the Crayon, has just been released, an my art is on the cover! I'm so excited about this. 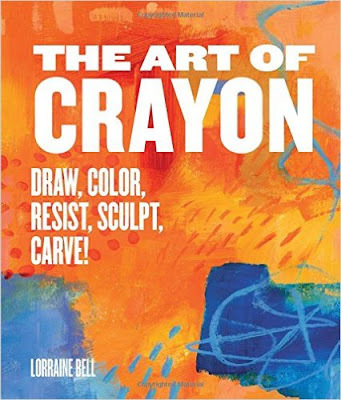 I don't have my copy yet (should be here any day), but I am quite looking forward to seeing what other artists do with crayons. You can check out Lorraine's blog post about it, and see who else contributed to the book. Looks like I am in good company. You can see previous posts I have done, including video, on using crayons and oil pastels here and here. I am teaching a one-day workshop at Art and Soul called Beyond Crayons: Mark-Making at its Finest" in April, 2017. It is full, but you can get on the wait list, or just show up and beg Glenny, the Queen, for a spot in the class, if you like. Or just take out your crayons, get Lorraine's book, and GO! My favorite crayons are Caran d'Ache Neocolor II. They are pigment-rich, and are a little more friendly with acrylic paints than oil pastels are. If working in oil media, no acrylic, I love using Sennelier oil pastels for their buttery quality, and Holbein's for a stiffer consistency but with the same pigment density. The Caran d'Ache Neopastels are great too. I think the Cray Pas and other very inexpensive oil pastels are like the Crayola of the oil pastel world. The professional quality oil pastels and crayons are well worth the money. Just my opinion. I am, as of recently, exploring R&F Paints' Pigment Sticks, which are like oil paint in stick form. I want to make crayon-like marks, but on a larger scale, and investigating ways to do that. These pigment sticks are GORGEOUS!!! Unlike oil pastels, pigment sticks DO dry, over time, so they can be used like oil paint, and combined with oil paint mediums like cold wax and "Galkyd" or other alkyd resins. Hope you enjoy a visit to Lorraine's blog, and to the web sites of the other contributors to her new book. Thanks for the visit here!